Why is it that playing in bright sunshine in early spring feels so special? It’s like it shouldn’t quite be, like you don’t really deserve it. You expect rain, or cold or – worse – frost. You don’t expect perfect sunshine, warmth and a gentle, caressing breeze. Druid’s Glen is in beautiful condition right now. The surroundings are bristling with colour, with rhododendrons in full bloom, buds promising vibrant foliage, gorse in glaring yellows, and swans and ducks roaming the waters. The greens are slick and fast – something else you might not expect at this time of year – and the fairways glisten in their tidy mowed lines, like back-combed velvet. 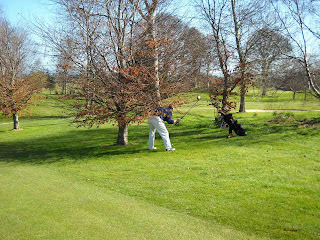 But golf always comes down to the company you keep and I played in a very friendly fourball with three old friends. Finbarr was over from New York and arrived with four golf balls – a very optimistic state of affairs. It didn’t look promising when his first drive soared deep into the trees to the left of the 1st, never to be seen again, but he lasted until the notorious 17th before his second ball disappeared into the water, beside a remarkably unflustered swan. 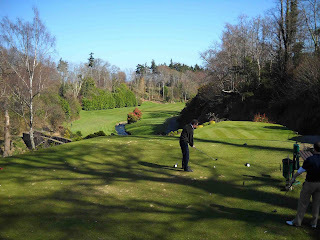 Off a 19 handicap at Druid’s Glen, losing only two balls is a successful visit. Ronan hadn’t played since June last year and his opening drive showed it – a nasty top that Sally Gunnelled 80 yards. At least it found the fairway. He plays off 9 and soon got back in the groove with a couple of sweet birdies and plenty of big drives. Charlie, well Charlie plays off 16 and is affectionately (I use the term loosely) known as a bandit. I call him a single handicapper in sheep’s clothing. Ronan paired me and Charlie against Finbarr and himself… moments before Charlie split the fairway with his tee shot, and then landed a five iron about eight feet from the flag. We were 6 up after 8, and we won all of the money rather comfortably. But it’s not about the money, is it! 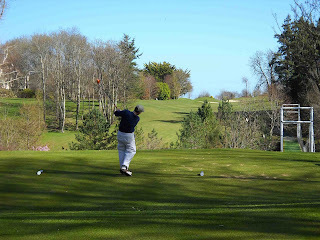 On a course this good, in such perfect weather, the guys were highly impressed by the thrill of every hole – and for me that has always been what makes Druid’s Glen so spectacular. The individuality of holes, the constant changes of pace and feel, and all those wonderful extras (suspension bridge, walled garden, ponds and streams, and blasted rock face…). Throw in the course’s condition and you have everything you could ask for. Then add in some perfect timing – your lunch being brought to the table just as the Cheltenham Gold Cup starts – and it’s a day that can’t get any better… at least not until the lads pull out their wallets and hand over the €5 you won. This brings me an intense feeling of jealousy. Course looks awesome, as ever. Remains my favourite.